18/01/13 -- EU wheat futures closed mixed with Jan 13 London wheat down GBP2.00/tonne to GBP211.60/tonne, benchmark May 13 GBP0.35/tonne higher to GBP215.00/tonne and new crop Nov 13 GBP0.65/tonne firmer at GBP188.55/tonne. Mar 13 Paris wheat was unchanged at EUR248.00/tonne. For the week, Jan 13 London wheat gained GBP4.60/tonne, May 13 GBP8.00/tonne and Nov 13 GBP5.55/tonne. Mar 13 Paris wheat added EUR3.25/tonne during the course of the week. London wheat seemingly gained more than it's Parisian counterpart due to sterling weakness, not that the UK will expecting to make too many foreign sales any time soon on the back of it. Indeed, it's beginning to look like the majority of the low bushel weight wheat left around might still be here come harvest 2013 as imports of better quality wheat continue to flood into the country. The pound has been under pressure all week ahead of an important speech, originally due today but now rescheduled for Monday due to the Algerian hostage crisis, from David Cameron on the UK's relationship with Europe. The pound has fallen 3.25% against the euro and 2.3% versus the US dollar since the turn of the year on speculation that the UK might leave the European Union. Today's losses saw sterling slump close to it's lowest level against the dollar in 4-months and a near 11-month low against the euro. The Buenos Aires Cereals Exchange said that the Argentine wheat harvest was over at 9.8 MMT, the Ministry there cut their estimate to 10.1 MMT. Both are considerably lower than the USDA's 11.0 MMT, and also make the latter's forecast for Argentine wheat exports of 7.5 MMT in 2012/13 look particularly unlikely. Brussels issued 340 TMT of EU soft wheat export licenses this week, bringing the cumulative marketing year to date total to 10.4 MMT. That is now fully 35% ahead of year ago levels and continuing to accelerate - at the end of November for instance EU exports were "only" 12% ahead of last season. Ukraine may squeeze out a little bit more wheat in the current marketing year, according to APK Inform. Exports as at the end of December were 5.9 MMT and may reach 6.5 MMT by the end of 2012/13, they predict. Winter crop conditions have been much better than twelve months ago in Ukraine, and optimism that crop potential will be looking good come the spring may encourage to government to allow a little more wheat to leave the country it appears. Concern over the health of the US winter wheat crop continue to mount, with potentially higher than normal levels of abandonment expected in the spring. Around 70% of mainland America is in drought, and central areas are the worst affected - right where the bulk of the winter crop is grown. "The odds are stacked heavily against a favourable hard red winter wheat harvest," said Gail Martell of Martell Crop Projections. "Winter storms have produced generous precipitation in Southern Plains winter wheat areas, but profound drought previously has stacked the odds against a favourable harvest. Fields are dry through a very deep layer. One or two winter storms are not enough to replenish parched soils," she maintains. 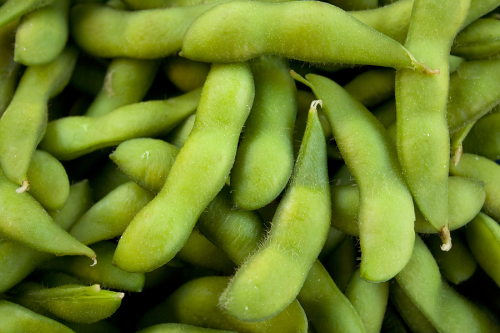 17/01/13 -- Soycomplex: Mar 13 Soybeans closed at USD14.30 1/4, down 6 1/4 cents; May 13 Soybeans closed at USD14.14 3/4, down 6 1/2 cents; Mar 13 Soybean Meal closed at USD414.00, down USD5.10; Mar 13 Soybean Oil closed at 51.49, up 18 points. Weekly export sales of 1.6 MMT (plus a further 118 TMT of new crop) were a marketing year high and easily beat expectations of 550-750 TMT. China took 845,600 MT of the old crop. On top of that there was an additional 126 TMT of optional origin sales to China AND a further 240 TMT of new crop sold to "unknown" reported under the daily reporting system. Not even including the latter, this takes total US commitments for 2012/13 to a staggering 89% in a marketing year that doesn't end until August. The market seems strangely relaxed about this, confident in the knowledge that a monster South American crop is coming to save the day. Exports topped 1 MMT for a record 16th week in a row as beans continue to pour out of America, mostly in the direction of China. 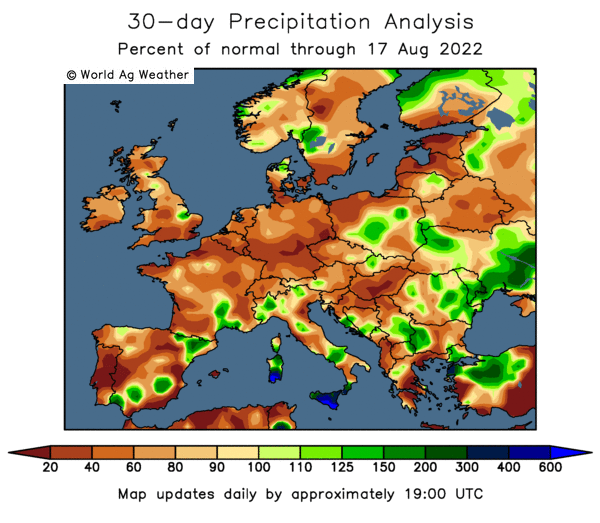 Rains across northern Brazil "remained abundant" in the past week, according to MDA CropCast, and should "remain extensive across northern areas this week" they add. Corn: Mar 13 Corn closed at USD7.24 1/2, down 6 3/4 cents; May 13 Corn closed at USD7.25 1/4, down 6 cents; Weekly export sales of 393,300 MT were in line with trade forecasts of 250-475 TMT. That takes total commitments t0 55% of the recently reduced USDA target compared to the five year average of 61%. It says a lot about export demand for corn that this weekly total was the highest since September. The trade will also be nervous about domestic demand for corn following yesterday's data showing weekly ethanol production as the lowest since at least mid-2010. News today of two more US ethanol plants taking downtime due to "an unusually unfavourable market for a fairly long period of time" highlight how bad margins have got. Strategie Grains said that EU corn output is set to rebound 15% from last year's disappointing harvest to 64.9 MMT. Rains in northern Brazil will "improve conditions for soybeans and second crop corn germination, but will continue to slow drydown and harvesting of first crop corn," said MDA CropCast. The IGC upped their 2012/13 world corn production estimate by 15 MMT to 845 MMT, although that is still below the USDA's 852 MMT. Agro Consult estimated Brazil’s 2012/13 corn crop at 74.7 MMT, substantially higher than the USDA's forecast of 71 MMT. Wheat: Mar 13 CBOT Wheat closed at USD7.81 1/4, down 3 3/4 cents; Mar 13 KCBT Wheat closed at USD8.37, down 5 1/2 cents; Mar 13 MGEX Wheat closed at USD8.69 1/4, down 2 1/4 cents. The USDA announced weekly export sales of 536,200 MT for 2012/13 plus a further 38,500 for 2013/14. That beat expectations for sales of 275-425 TMT and also topped the amount required to hit the USDA's target for the full 2012/13 season (around 435,500 MT). Significantly, the old crop sales included 146 TMT to Egypt, 112 TMT to China and 81 TMT to unknown. Iraq bought 250 TMT of Australian wheat, along with 50 TMT of Canadian wheat in it's latest tender. Concerns are mounting over the health of the US winter wheat crop. "Drought covers approximately 92% of the central and northern Plains, 56% of the southern Plains and Delta, and 53% of the Midwest," said MDA CropCast. 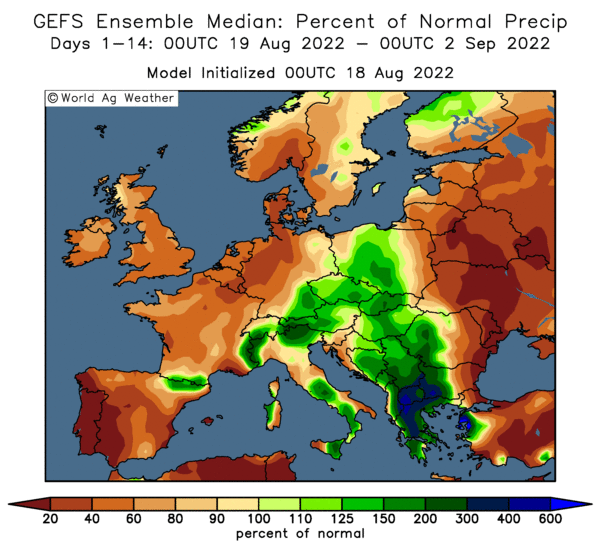 "Minor improvements (are expected) across the Delta and far eastern Midwest later next week, but dry conditions across the central and western Midwest and Plains will allow extreme to exceptional drought conditions to continue there through the next ten days," they add. 17/01/13 -- EU grains were mixed but mostly lower with Jan 13 London wheat down GBP0.85/tonne to GBP213.60/tonne, May 13 also down GBP0.85/tonne to GBP214.65/tonne and new crop Nov 13 falling GBP0.25/tonne to GBP187.90/tonne. Mar 13 Paris milling wheat was EUR2.50/tonne lower to close at EUR2498.00/tonne. London wheat fared a little better than Paris wheat as the pound fell to it's lowest levels against the euro since March 2012 at 1.1950, and close to a two-month low versus the US dollar of 1.5950, on concerns over the outlook for growth in the UK. FranceAgriMer pegged the French soft wheat area for the 2013 harvest at 4.95 million hectares, an increase of 1.6% on last year. The durum area is seen down 6.7%. 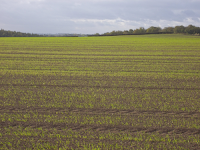 For barley they forecast a 10% increase in plantings to 1.08 million hectares, and for rapeseed a 7.1% decline to 1.6 million ha. Strategie Grains cut 1.7 MMT off last month's estimate for 2013/14 EU-28 soft wheat production to 133.3 MMT (they now include Croatia in their forecasts as they are scheduled to become a full member of the bloc on Jul 1). The largest cuts were said to be for Germany, the UK and Poland. Although specific numbers for each aren't currently available, the combined reduction for these three was said to be 1.5 MMT. Smaller reductions were also forecast for France, Denmark and Sweden. EU-28 barley production was forecast at 54.7 MMT, little changed on a year ago, whilst corn output is set to rebound 15% from last year's disappointing harvest to 64.9 MMT. The FAO estimated Ukraine's 2012/13 grain crop at 45.3 MMT, down 20% on last year, including 15.5 MMT of wheat and 21.0 MMT of corn. They estimate Ukraine's wheat exports at 6.0 MMT this season, with corn shipments more than double that level at 12.7 MMT. The IGC raised their world 2012/13 wheat crop estimate by 2 MMT to 656 MMT, which is also 2 MMT higher than last week's USDA number. World corn output was also increased, by 15 MMT to 845 MMT, although that is still 7 MMT less than the USDA's estimate. Iraq confirmed that it had bought 300 TMT of mostly Australian wheat in it's tender which closed on Sunday. The amount also included one cargo from Canada. Syria and Tunisia are also in the tender market. Stats Canada said that the country had exported 7.62 MMT of OSR in the first 11 months of 2012, which is 10% more than in the same period in 2011. The increase was driven by a sharp increase in demand from China, who were responsible for taking 2.7 MMT during the period - up 122% vs Jan/Nov 2011. 16/01/13 -- Soycomplex: Mar 13 Soybeans closed at USD14.36 1/2, up 23 cents; May 13 Soybeans closed at USD14.21 1/4, up 21 1/2 cents; Mar 13 Soybean Meal closed at USD419.10, up USD7.20; Mar 13 Soybean Oil closed at 51.31, up 44 points. Beans were underpinned by the suggestion that China has been actively buying, booking a reputed 30 cargoes in the past week of US/South American beans. Demand from that quarter is expected to remain strong in the run-up to the Chinese New Year celebrations next month. 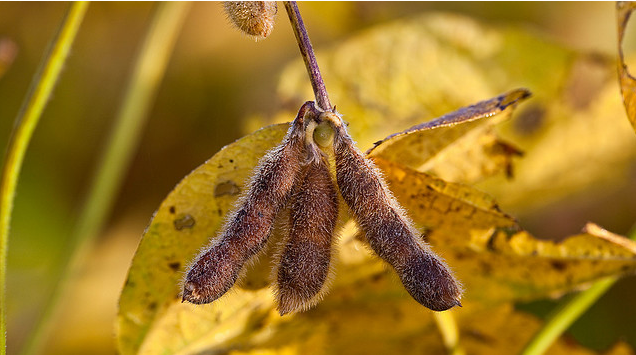 "Accelerated by economic growth, China has rapidly become the world’s largest crusher of soybeans," the USDA said in last week's WASDE report. The FAO estimated Argentine soybean production at 53 MMT this year, 1 MMT less than the USDA predict. Satellite imagery firm Lanworth Inc are more optimistic, even if they did cut their forecast to 55.2 MMT versus a previous estimate of 56.6 MMT. For the Brazilian soybean crop they go for 79.8 MMT, unchanged from their previous estimate and 2.7 MMT less than the USDA predicted last week. There's some talk of dryness developing in parts of Argentina and Brazil, although it seems very early days to start calling it a problem. Fund buying in beans was estimated at around 4,000 contracts on the day. Trade estimates for tomorrow's weekly export sales are 550-750,000 MT. Corn: Mar 13 Corn closed at USD7.31 1/4, up 3/4 cent; May 13 Corn closed at USD7.31 1/4, up 1/2 cent. Corn was doing quite nicely, thank you very much, in the overnight session until the US Energy Dept issued their weekly ethanol production data. That showed US output last week down 5% from the previous week to only 784,000 barrels per day, the lowest weekly total since they starting issuing data in mid-2010. That's well below the 826,000 barrels per day needed to keep pace with the USDA's projected demand forecasts for 2012/13. Very poor ethanol margins are said to be behind the slump. The FAO estimated this year's Argentine corn area at 4.6 million hectares, down 8% from a year ago. Production is pegged at 25.5 MMT, up from 21.0 MMT a year ago but well below the USDA's predicted 28.0 MMT crop. Lanworth Inc estimated this season's Argentine corn crop at 26.8 MMT versus previous estimate of 27.4 MMT. For Brazil they went 75.6 MMT versus a previous estimate of 76.0 MMT. Taiwan bought 60 TMT of Argentine corn for March shipment overnight. US corn exports have been consistently poor all season. Trade estimates for tomorrow's weekly export sales report are 250-475,000 MT. The level required to hit the USDA's newly reduced export target for 2012/13 is around 334,000 MT. Wheat: Mar 13 CBOT Wheat closed at USD7.85, up 2 1/4 cents; Mar 13 KCBT Wheat closed at USD8.42 1/2, up 4 1/4 cents; Mar 13 MGEX Wheat closed at USD8.71 1/2, up 5 1/4 cents. Wheat was dragged off the highs by the demise of corn following the release of the weekly ethanol production data. An ongoing drought in winter wheat areas on the US Plains is grabbing more attention. "Drier weather should prevail across the Plains and western Midwest through next week, which will allow drought conditions there to persist," said MDA CropCast. Lanworth Inc cut their forecast for US 2013/14 wheat production from 54.3 MMT to 53.8 MMT, down 13% versus the USDA's estimate for the current season's crop of 61.8 MMT due to persistent drought on the Plains. Algeria bought 400 TMT of probably French wheat in their tender. The market will be looking to see how US wheat fares in the recent tenders from Iraq and Syria. Tomorrow's weekly export sales report will also be scrutinised for signs that demand for US wheat is picking up. Trade estimates for that are 275-425,000 MT. China is said to be buying spring wheat for shipment out of the west coast of the US due to the inferior quality of this season's crop. It's Jan/Nov 2012 grain imports (corn, wheat and rice) were up almost 300% on 2011. 16/01/13 -- EU grains closed mixed with Jan 13 London wheat down GBP0.55/tonne to GBP214.45/tonne, May 13 up GBP0.50/tonne at GBP215.50/tonne and new crop Nov 13 was GBP1.40/tonne firmer to GBP188.15/tonne. Front month Mar 13 Paris milling wheat fell EUR2.00/tonne to close at EUR250.50/tonne. London wheat corrected yesterday's strange close which saw soon to expire front month Jan 13 close GBP5.00/tonne firmer at GBP215.00/tonne, whilst May 13 only rose GBP2.50/tonne to also end at GBP215.00/tonne. Prices closed off the day's highs as US corn fell late in the day, dragging wheat down with it. The reason for corn's demise was news that US ethanol production slumped sharply last week, to the lowest levels since the US Energy Dept began issuing weekly data in mid-2010 in fact. At home, customs data released yesterday shows that the UK has imported more than a million tonnes of wheat in the first 5 months of the marketing year, suggesting that Defra's estimate of full season imports of 2 MMT may be on the low side. Exports meanwhile stood at 477 TMT as at the end of November, compared to what Defra call a "surplus available for either export or free stock" of only 750 TMT for the entire season. OSR exports were up 29% as at the end of November at 409 TMT, and imports were down 85% to less than 5,000 MT, suggesting that availability of rapeseed will also be tight towards the end of the marketing year. US drought and winterkill concerns are starting to get more attention now that we are past the January USDA supply and demand report. There are concerns about Russia too. "Southern Russia winter wheat was planted under very dry conditions last fall and was weakly established. Less than half of normal rainfall was received September-November in many key wheat growing areas," say Martell Crop Projections. "Unseasonably warm temperatures made fall moisture stress worse. Wheat germinating late, due to drought, may not have achieved maximum hardiness from a shortened fall growing period," they add. The head of the Russian Grain Union is quoted on Reuters as saying "about 1.2 million (hectares of winter grains) can be written off because of dry weather conditions." 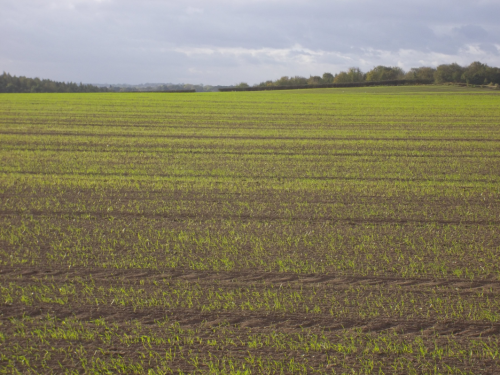 This area will be replanted in the spring, although yields will inevitably be reduced. News wires report that Algeria bought 400,000 MT of wheat overnight for mostly April shipment. French origin is said to be the most likely source, although Canadian wheat may also have featured. With EU-27 wheat exports already running more than a third up on a year ago, despite reduced production, extra export business like this will only serve to tighten availability further later in the season. 15/01/13 -- Soycomplex: Mar 13 Soybeans closed at USD14.13 1/2, down 4 1/2 cents; May 13 Soybeans closed at USD13.99 3/4, down 5 1/2 cents; Mar 13 Soybean Meal closed at USD411.90, down USD5.60; Mar 13 Soybean Oil closed at 50.87, up 42 points. Fund selling in beans was estimated at around 2,000 lots on the day. Michael Cordonnier upped his Brazilian soybean crop estimate to 81.0 MMT from his previous estimate of 80.0 MMT. That was offset by him reducing his Argentine soybean crop estimate to 53.0 MMT from a previous estimate of 54.0 MMT. He said 91-92% of the Argentine soybean crop has been planted. He gave a total South American soybean crop estimated of 147.2 MMT, up 28% versus the 2011/12 crop of 115.3 MMT. Rumours suggested overnight US soybean sales to China, but there was no official confirmation from the USDA. Corn: Mar 13 Corn closed at USD7.30 1/2, up 6 1/2 cents; May 13 Corn closed at USD7.30 3/4, up 7 3/4 cents. Funds were said to have been net buyers of around 10,000 corn contracts on the day. Michael Cordonnier estimated the Brazilian corn crop at 70.0 MMT, unchanged from previous estimate. He placed Argentine output at 22.5 MMT, which was also unchanged from previous estimate. The Argentine Ag Ministry are more bullish, projecting a crop of a record 28-30 MMT versus the previous record crop set in 2010/11 of 23.8 MMT. Some suggest that the Ministry are deliberately inflating their forecast in a feeble effort to contain inflation. Michael Cordonnier pegs the total South American corn crop at 95.6 MMT versus 96.5 MMT in 2011/12. Wheat: Mar 13 CBOT Wheat closed at USD7.82 3/4, up 15 3/4 cents; Mar 13 KCBT Wheat closed at USD8.38 1/4, up 14 3/4 cents; Mar 13 MGEX Wheat closed at USD8.66 1/4, up 13 1/2 cents. Funds were said to have been net buyers of around 5,000 Chicago wheat contracts on the day. Talk of potential crop damage to US winter wheat as weather conditions turn much colder on the Plains was supportive, especially with the funds still holding a large net short in CBOT wheat. Japan is tendering for 118 TMT of mostly US wheat for Feb/Mar shipment. 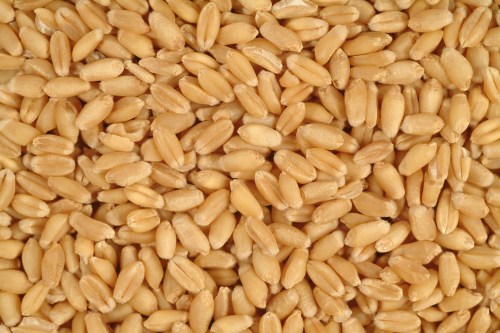 Morocco is tendering for 160 TMT of durum wheat for April shipment. The CME Group are to lower the initial margins on wheat to USD3,240 from USD3,713 after the close tonight. 15/01/13 -- EU wheat futures closed higher with Jan 13 London wheat up GBP5.00/tonne to GBP215.00/tonne, benchmark May 13 GBP2.50/tonne higher also at GBP215.00/tonne and new crop Nov 13 GBP1.25/tonne firmer at GBP186.75/tonne. Mar 13 Paris wheat was EUR3.00/tonne higher at EUR252.50/tonne. For London wheat this was the biggest one day gain for a front month since late July. US wheat is gaining support from ideas that it has become cheap relative to corn. The Mar 13 wheat/corn differential was 136 cents two months ago. One month ago that had fallen to 84 cents and as of last night's close the gap was down to only 43 cents. The substantial size of the fund short in wheat is also a supportive factor. Will they be willing to increase that short further, or are they more likely to use any dips as a buying opportunity? The latter seems to be what the trade is thinking, for the moment at least. The latest customs figures available show that the UK exported less than 100 TMT of wheat in November, the lowest total for the month since 2001, according to Agrimoney.com. Wheat imports in November meanwhile were 225 TMT, mainly from France, Germany and Poland. That means that 2012/13 imports have now topped 1 MMT and are thus already more than the volume shipped in during the whole of last season. The proportion of home grown grain used in domestic flour, starch and ethanol production has fallen from around 89% in July to closer to 80% in November. 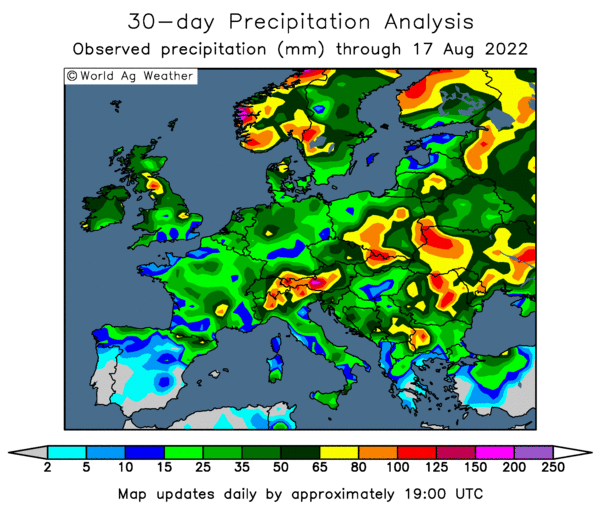 Meanwhile there's plenty of trade talk of potential crop damage to winter wheat in the US and Russia. Morocco are looking for 160 TMT of durum wheat for April shipment. Their 2012/13 marketing year to date (to end Dec) grain imports are 3.23 MMT, up 23% on last season. Of that total wheat imports stand at 1.77 MMT, an increase of almost 25% on last year. Their main wheat supplier so far has been Ukraine (640 TMT), followed by France (480 TMT) and Canada (410 TMT). They also imported 1.37 MMT of corn in the current marketing year, with 880 TMT of that total coming from Brazil. Russia sold 61,603 MT of wheat from their intervention stocks in it's latest government sale, bringing the total sold since sales began on Oct 23 to 1.26 MMT. Ukraine’s State Statistics Service pegged the final 2012 wheat crop at 15.76 MMT, down 29% versus 22.3 MMT in 2011. Corn output is seen 20.92 MMT, down a more modest 8% from 22.8 MMT in 2011. Barley production is said to be 6.94 MMT, down 24% versus 9.1 MMT in 2011. 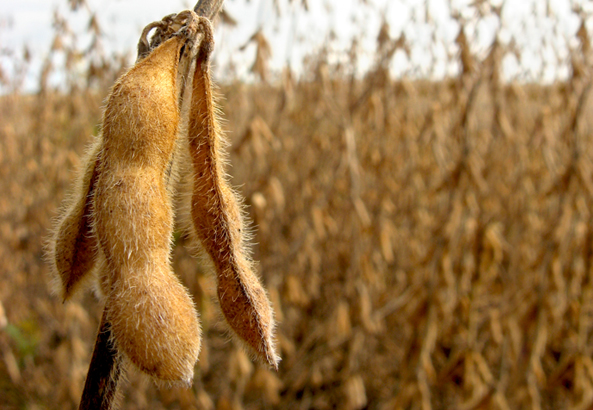 14/01/13 -- Soycomplex: Mar 13 Soybeans closed at USD14.18, up 44 3/4 cents; May 13 Soybeans closed at USD14.05 1/4, up 41 1/4 cents; Mar 13 Soybean Meal closed at USD417.50, up USD13.20; Mar 13 Soybean Oil closed at 50.45, up 121 points. Funds were heavy buyers, coming in for an estimated 16,000 soybean contracts on the day, plus around 5,000 each of meal and oil. The trade is still digesting Friday's USDA numbers. Despite a small, but expected, increase in 2012/13 US ending stocks to 135 million bushels that still equates to only 2 1/2 weeks of supply. NOPA reported the December US crush at 159.9 million bushels - the second largest o record. Friday's USDA numbers have the US to crush 5.75% fewer soybeans this season than last, yet the current pace is almost 10% ahead of last year. Exports too continue to run amok. To underline that fact the USDA today announced the sale of 120 TMT of soybeans to China for 2012/13 shipment. Export inspections were strong once again at 39.123 million bushels (37-45 million anticipated). Both exports (80% of the USDA's target is shipped or on the books already as of last week) and domestic crush would therefore appear to have the potential to have been underestimated. And there's only a 2 1/2 week supply cushion. As well as a large South American crop looming, there are also the likelihood of large logistical problems in that region too. Corn: Mar 13 Corn closed at USD7.24, up 15 1/4 cents; May 13 Corn closed at USD7.23, up 16 cents. Fund buying was estimated at around 9,000 corn contracts on the day. Export inspections of only 9.239 million bushels were on the low side of expectations of 8-12 million. Unlike soybeans corn sales and shipments continue to lag. Export inspections this week a year ago were 30.055 million bushels. Year-to-date inspections are now 272.357 million bushels which is well under half of where things were a year ago. The USDA cut their US corn export potential on Friday. 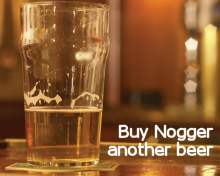 but an increase in domestic usage still leaves 2012/13 ending stocks at less than three weeks worth of supply. MDA CropCast raised their Brazilian corn production estimate by 570 TMT from last week to 71.37 MMT citing better crop conditions. They left the Argentine corn production forecast unchanged at 23.1 MMT, which is in line with those of other analysts but well below the USDA's stubborn 28.0 MMT projection. Michael Cordonnier estimates Argentine corn output at 22.5 MMT, with 10% of the crop still left to plant. Wheat: Mar 13 CBOT Wheat closed at USD7.67, up 12 1/4 cents; Mar 13 KCBT Wheat closed at USD8.23 1/2, up 16 1/2 cents; Mar 13 MGEX Wheat closed at USD8.52 3/4, up 7 1/2 cents. Fund buying/short covering in Chicago wheat was estimated at around 5,000 lots. Weekly export inspections of 10.598 million bushels were below trade estimates of 12-16 million. Friday's USDA numbers held steady their prediction for 29.5 MMT worth of US exports this season, when some had been expecting a reduction. A 1 MMT cut in US ending stocks to 19.5 MMT placed them at 15 weeks worth of usage, which is much better than those for corn or soybeans but still a 4 year low. MDA CropCast pegged the US winter wheat crop at 1.822 billion bushels, up 21 million on a week ago. US weather conditions are turning much colder on the Great Plains, increasing winterkill fears. There are similar concerns coming out of Russia too. The Argentine Ag Ministry said on Friday that 97% of their wheat crop has now been harvested. A Reuters poll of 15 analysts on 2013 Canadian planting intentions places all wheat plantings at 24.7 million acres, up 4% from a year ago. 14/01/13 -- EU grains were firmer with Jan 13 London wheat up GBP3.00/tonne to GBP210.00/tonne, May 13 up GBP3.00/tonne lower to GBP212.50/tonne and new crop Nov 13 rising GBP2.50/tonne to GBP185.50/tonne. Mar 13 Paris milling wheat was up EUR4.75/tonne to close at EUR249.50/tonne. European grains were playing catch-up following the late release of Friday's bullish USDA data, which only came out as the markets here were closing. Further gains in the electronic overnight market added additional support. The trade is, for now at least, focusing on the tight US stocks situation. For corn 2012/13 ending stocks were pegged well below expectations at 15.3 MMT on Friday - a 17 year low and equivalent to less than 3 weeks worth of supply. US wheat carryout was estimated at 19.5 MMT, somewhat better than corn and 15 weeks worth of supply, but even so still at a 4 year low. The US weather is seen turning much colder on the Plains this week, increasing winterkill chances amongst already poorly established crops. "Winter wheat potential in the Great Plains is already irreversibly damaged by historically significant drought," noted Martell Crop Projections. "Oklahoma wheat farms have accrued a 6.8 inch moisture deficit in the 6 months back to July, receiving only 50% of normal rainfall. This is the United States second top winter wheat state behind Kansas. Wheat growers in late December rated their wheat at 21% very poor, 40% poor, 28% fair, 11% good and 0% excellent," they added. A little closer to home, Russia's IKAR agency are quoted as saying that up to 25% of the nation's crops may have suffered winterkill in some southern and western areas after temperatures suddenly plummeted in places with little or no protective snow cover. We should have the results of an Iraqi wheat tender, which closed on Sunday, later this week. There were apparently no Russian or Ukraine offers. Australian wheat was said to be the cheapest offer. Algeria is also tendering for optional origin wheat for Mar/Apr shipment. France would normally supply the bulk of Algeria's wheat requirements, but may miss out this time on price considerations. We will have to wait and see. Paris wheat did well to brush off the effects of a euro rising to an 11-month high against the dollar (and a 9-month high against the pound), which will further erode EU wheat's competitiveness - not that we need to pick up any more export business this season. MDA CropCast upped their 2013/14 world wheat production estimate by 0.5 MMT to 678.4 MMT on acreage adjustments in the US. 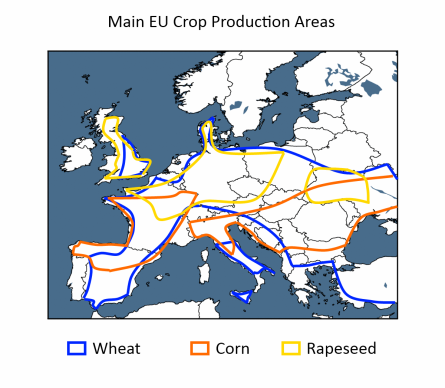 They place the winter wheat crop in Europe at 132.0 MMT this year, which would represent an increase of 4% on last year. The FSU-12 crop is seen rising 27% to 90.9 MMT. Russia's grain exports in the first six months of the 2012/13 season (to Dec 31) were 12.9 MMT, a drop of 17% on the same period last year. December exports of 970 TMT included 630 TMT of wheat and 210 TMT of corn. Very little wheat is expected to be exported after this month. 14/01/13 -- It's very interesting to note that Friday's USDA numbers pegged US soybean consumption and exports at a combined 80.3 MMT. US 2012/13 ending stocks were estimated at only 3.7 MMT, that's less than 2 1/2 weeks worth of supply, which is even tighter than that for corn. It's doubly interesting to ponder that US exports are still raging ahead, with shipments plus outstanding sales already at 80% of the USDA's target for the whole of 2012/13. Physical shipments have in fact topped 1 MMT for a record 15 weeks in a row. Today we have the news that the NOPA Dec crush came in at 159.9 million bushels, up 2.6 million on November and the second largest monthly crush on record (beaten only by Jan 2010). This domestic disappearance beats the level needed to match the USDA's crush projection for 2012/13 by a hefty 21.2 million bushels. In fact, it takes the US crush to 9.9% ahead of last year's levels, when the USDA are projecting a decline of 5.75% for the full 2012/13 season. Meanwhile the USDA have just announced the sale of 120 TMT of soybeans to China for 2012/13 shipment this afternoon.